Cass County courthouse, Linden, Texas, Recorded Texas Historic Landmark. The restored Cass County Courthouse without the 1980 addition. Known as the oldest continually used county courthouse in Texas, the 1861 Cass County courthouse in Linden has seen its share of changes through the years. 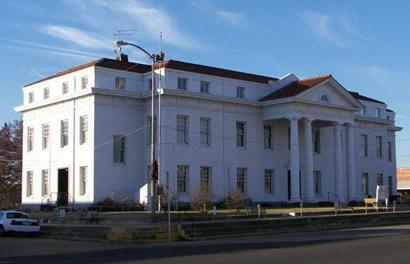 The first courthouse was a two-story, wood frame structure built on the same site as the current courthouse in 1853-54. It was later sold and moved off the square, eventually being destroyed by a tornado. Construction on the second courthouse began in 1859 and was completed in 1861. The 1861 courthouse was originally designed by Cass County Judge Charles Ames which he modeled after the nearby 1851 Harrison County courthouse. 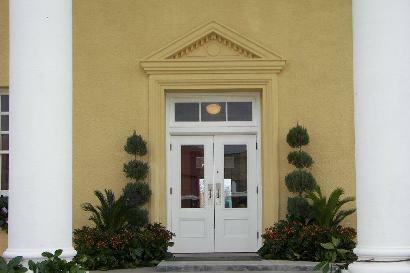 It was a two-story, Greek Revival style building made of locally fired brick (painted Spanish brown) with a hipped roof and a central, square drum with a small cupola on top. 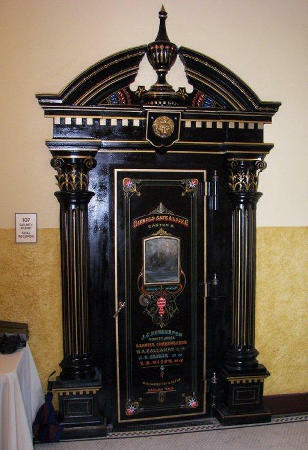 It retained this appearance until 1905 when an twenty foot addition was built onto the building�s east side and the brick was painted Venetian red. In 1908, a tornado swept through Linden, damaging the town and the courthouse, destroying the building�s cupola. The courthouse was repaired and a Queen-Anne style cupola was added to the building the following year. 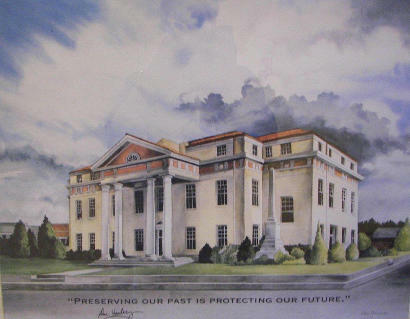 In 1917, architectural designer Stewart Moore and engineer Fred Halsey remodeled and redesigned the courthouse to represent the Classical Revival style it has today. The cupola was removed and the north and south entrances received two-story, pedimented porticoes with gabled roofs and two pairs of Doric columns. The east and west side wings also received three-story additions which included new staircases and the exterior brick was covered with a yellow-beige colored stucco. In May of 1933, a fire destroyed the porticoes and the roof over the centrally located courtroom. 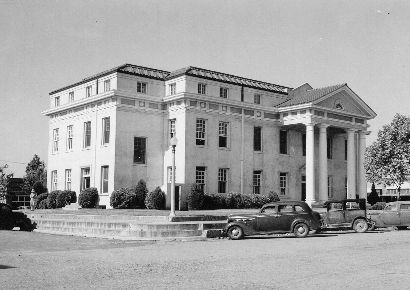 Repairs were completed in 1934 with an extended third story over the courtroom with a concrete and steel truss to stabilize the building. 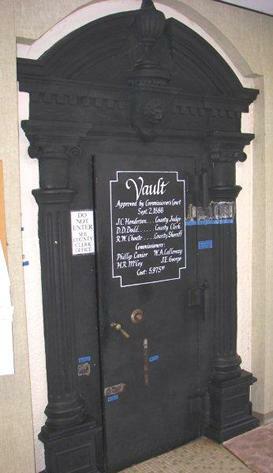 Around 1940, the exterior of the building was painted white and a 1980 addition on the west side provided the building with its first elevator. 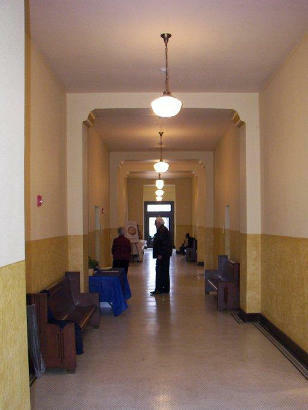 Over the years, renovations to the interior have made the courthouse look like a modern office building. 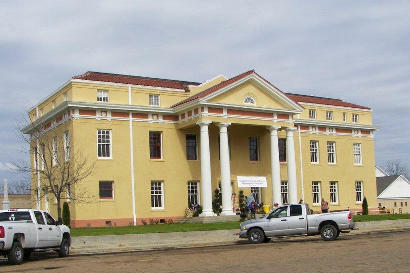 In January of 2008, Cass County was awarded a grant from the Texas Historical Commission for $4.4 million towards the restoration of their courthouse and construction began in 2009. 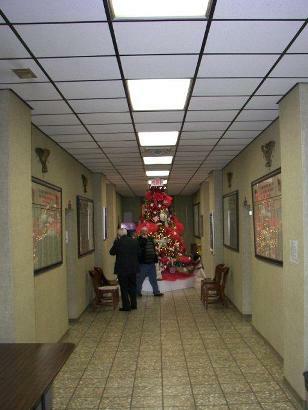 The restoration was completed and the courthouse rededicated in February of 2012. Along with the addition of updated electrical, environmental and plumbing systems, a new elevator was installed in the east wing. The interior and exterior was returned to its 1934 appearance, restoring the original interior and exterior colors, ceiling molding, cornices and other architectural details and removing the dropped ceilings. The 1980 addition was also demolished. (Structural changes to the building since its original construction makes it impossible to return the building to its 1860s appearance.) 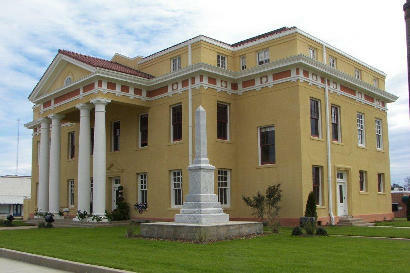 This building now proudly takes it place among the restored historical county courthouses in Texas. Source: County history information from The Handbook of Texas Online. 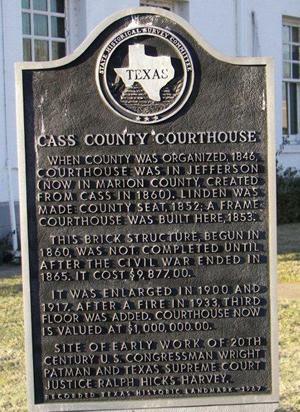 Courthouse information from the Texas Historical Commission County Atlas and the book �The Historic Cass County Courthouse� by Sue Morris Lazara. Cass County Courthouse (SW corner) without the 1980 addition.